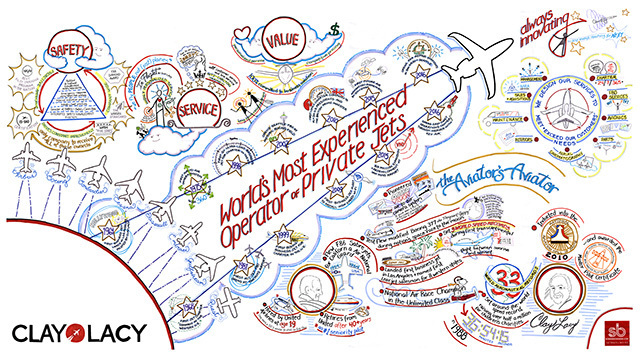 Clay Lacy Aviation and creative visionary, Sunni Brown, connect a legendary history and engaging future— through visual storytelling— at this year’s National Business Aviation Conference, October 10-12, 2017, in Las Vegas, Nevada. Clay Lacy Aviation— a regular exhibitor at NBAA-BACE, the premier business aviation event and meeting place— is excited to partner, once again, with creative business consultant Sunni Brown. Sunni is the Chief Infodoodler at Sunni Brown Ink and was named one of Fast Company’s “100 Most Creative People in Business.” Sunni will engage attendees through a visually inspiring message— shared by a 14-foot mural— at the Clay Lacy booth. Sunni is an expert at leading progressive companies to ‘think bold’ and ‘beyond’ typical ideas through the use of ‘doodles.’ Doodling business strategies and brand messaging has enticed companies like Zappos, Disney, Sharpie, The Oprah Winfrey Network, and Dell to call upon Sunni’s talent to communicate their brand messages and discover unique solutions. In addition to offering a way to connect and engage with individuals, “[Doodling] has a profound effect on creative problem-solving and deep information processing,” says Sunni in her very popular TED Talk. Scott Cutshall, VP of Brand Development at Clay Lacy was first drawn (pun intended) to Sunni’s work due to the unconventional way that her creativity could portray the story of aviation pioneer, Clay Lacy, and the company that he founded. Clay Lacy Aviation’s culture is one that is dotted by legendary achievement and a rich history. With almost fifty years in business, describing everything that the company encompasses, in words, is often challenging. Sunni is the colorful link to connect the dynamic and deep past of Clay Lacy Aviation to its’ bright future. 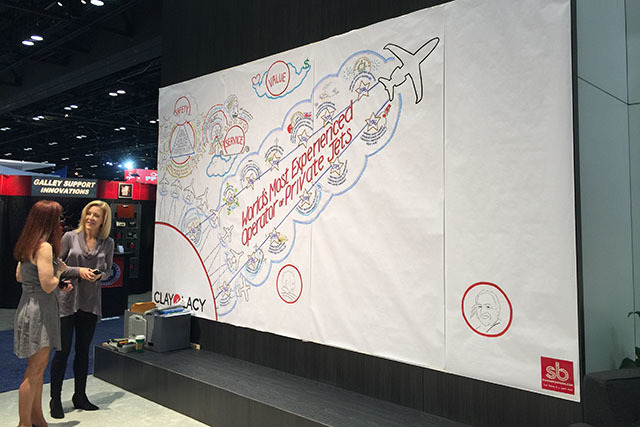 Visit Clay Lacy booth #N5721 at the 2017 NBAA-BACE to see Sunni Brown’s creativity live, share your own inspiring message, and meet the Clay Lacy team.